Emilie Tan was born in Montreal, Canada and has been living in Melbourne, Australia for more than 5 years now. She works as a travel agent by the day, but her true passion lies in fitness and nutrition. With her husband Luke, she is the co-founder of Evolve’d Generation, a website that aimed to spread positive change to the world through connection and inspiration. For 12 years, Emilie competed in Short track speed skating for both Canada and Australia at an international level. She considers her 5th place at the 2003 World Junior Championships along with her five medals at the 2003 Canada Winter Games highlights of her career. She also participated in national level track competitions and just competed in her first bodybuilding/bikini show at the IFBB Victoria titles. Since a young age, I had been interested in vegetarianism as I never really liked the taste of meat. I was always cooking tofu or lentil based dishes for my family and knew I would one day forgo meat completely. I tried a “pescatarian” diet around the age of 22-23 but failed as I was also following a very unhealthy lifestyle (binge drinking, social smoking, etc) and replaced meat with lots of eggs and cheese. I had been suffering from pre-menstrual syndrome and digestive problems since my teen years and just could not get to the bottom of it. Even after taking gluten out of my diet, things had not really improved and got even worse when following a low carbohydrate “paleo” style diet. I clearly had enough and started looking for answers. My eye caught the frequent FaceBook posts of an acquaintance about veganism. I had a gut feeling that it might be the answer. I started watching videos from Freelee and the Durianrider from 30 bananas a day, bought John Robbins’ “The Food Revolution” and was convinced pretty quickly. I started by eliminating dairy, red meat and poultry, then fish and seafood and finally, I gave up eggs, honey and other animal by products for good. I also pledged to never buy leather, wool, fur or silk garments again. My digestion has improved greatly and I do not suffer from pre-menstrual syndrome anymore. I have also connected with so many new amazing people who share veganism as an interest. Making an informed decision to do my best to not participate in industries that cause the suffering of any of my fellow earthlings. I like to mix things up a little to keep my body guessing and stay focused and motivated. I usually weight train 2 to 4 times a week with my husband/personal trainer. I love to do circuit style workouts, but depending on what we are trying to achieve (muscle gain, fat loss, maintenance, etc) Luke plays around with repetitions, sets and rest time. I love to run, it really clears my mind and helps me to meditate. I try to run at least once a week. Last year, I completed my first half marathon in 1:41 and would like one day to finish a full marathon under the 3:30 mark. If I have to do cardio at the gym, I like the stepper and also doing intervals on the treadmill. I have also been practicing Bikram Yoga on and off for almost 6 years now. Since becoming a vegan, I have noticed a clear improvement in all my postures. I would like to increase my practice in the near future and eventually do the teacher training to become an instructor. I like to answer any fitness and training related questions to the best of my knowledge. As mentioned previously, I would like to become a Bikram yoga instructor and plan on getting a certificate in personal training. That vegans are malnourished and scrawny due to a lack of nutrients people believe are only available through consumption of animal products. I believe in preaching by example and use my body, positive attitude and unlimited energy as a proof that it is not true at all! My stamina. I have a very good cardiovascular endurance and coupled with a high carbohydrate fruit diet I get through the most gruesome workout. I do not have the best coordination and my flexibility is quite challenged to say the least! I find Bikram yoga, when practiced regularly really helps with that. People are always very curious at work and love to see what I eat for lunch. It is always funny to see people’s expression when you tell them you can eat more than 15 bananas a day! It is always nice when a colleague tell me I have inspired them to eat less meat and more fruits and vegetables. I really feel like I’m reaching my goal, which is preaching by example. Yes. They know it is the right thing to do and they love sharing a vegan meal with me, however to them it’s “extreme” and I believe they have no intention to follow my footsteps in the near future. Feeling like I am making a difference. Knowing that I am a part of a movement that is saving our planet from a grim future. In my athletic endeavour, I look up to vegan bodybuilder/bikini athletes like Mindy Collette, Samantha Shorkey and closer to me here in Australia, Simone Collins, Koren Young Sutherland and Natasha Seeto who all placed/won in different associations. Breakfast - Fruits! I like to blend a few frozen bananas with some water or rice milk, a few dates and a bit of cinnamon until it has the consistency of ice cream. Another favorite is a bowl of chopped apples and bananas with an apple/banana and date paste, sprinkled with cinnamon. Lunch - Fruits again! My favorite these days is a few chopped bananas mixed with baby spinach/cos lettuce/iceberg lettuce covered in with a “dressing” made of dates, passionfruit, mixed berries, cinnamon and carob powder. Yummy! Dinner - A big salad made out of spiralized carrots, zucchinis and beetroot. I like to add green onions, capsicum, celery, cherry tomatoes and a home made tahini or pine nut based dressing. I will also have a bit of rice or sweet potato on the side. During the winter, I might have a fully cooked vegetable and rice/sweet potato/gluten free pasta based dinner as I do crave that warming comfort. Healthy: “ice cream” made with berries, rice or almond milk and a little bit of banana vegan protein powder; green smoothie made with a bunch of greens and some lemon juice; any fruit in its most simple form. Not so healthy: I am not a fan of junk food, however I love anything Mexican including tequila and margaritas. A restaurant in Melbourne called La Tortilleria has the best vegan cheese I have ever tasted! I swear it tastes better than what I remember of cheese. I also love Vegie Bar’s vegan nachos and enjoy a raw desert once in a while. Protein - In general, I get my protein from the high volume of fruits and vegetables I eat which is enough. However, I do enjoy some legumes once in a while like lentils, chickpeas or black beans. I rarely eat soy, but I do enjoy a bit of Tempeh in a dragon bowl and vegan miso soup. Only B12 - on a daily basis. I also take BCAA when I weight train. Eat enough calories from whole food only sources. At the beginning, it is a great idea to keep track of the calories you eat as it is easy to not eat enough while on a vegan diet as plant food is not as calorie dense as animal products. Training wise, make sure to mix things up a little to keep your body guessing. Weight training is king to make muscle gain. You should definitely work with a strength coach to point you in the right direction if you are serious about getting results. It makes a world of difference. Keep your fat and protein intake to less than 10% each of your overall calories. Carbs, carbs, carbs - preferably from fresh fruits whenever you can and whole starches like brown rice, sweet potatoes and gluten free pasta when fruits are hard to find/not in season. I also find that a big salad at night helps with elimination and detoxification. For a lot of people, keeping soy to a minimum will make a difference. Only have it once in a while and stick to organic and whole Tofu, Tempeh, edamame or miso. For training, the same advice as muscle gain applies. I can also add that going crazy on the cardio is not a solution, however, a couple of sessions of sprints or other types of high intensity interval training per week is a good way to get the weight shifting. Make moving and eating well a part of your life. When you eat enough carbohydrates coming from fruits and/or starches and vegetables, your cells are satiated and happy. You then do not crave junk food. Do not restrict the calories coming from low fat sources of carbohydrate. If you are craving bad stuff, it means you are not eating enough fruits/starches. As mentioned before, I preach by example. People are always impressed with how much energy I have and how I am rarely sick. I like to talk about the way I eat and try and keep it positive. I also do try to inform people with facts about factory farming and the dairy/egg industry. I do believe that a lot of people ignore completely what is really happening and would probably start considering the lifestyle if they knew. To get a conversation started, I also love to wear t-shirts with vegan messages. First have a look at our website where you can find information about training and veganism and a lot more. 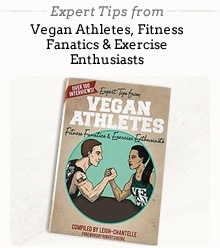 We have a list of different resource related to veganism: documentaries, books, website, etc Get informed!